In A Dream of John Ball Will Green asks the time-travelling narrator, ‘Hast thou seen Oxford, scholar?’, at which ‘A vision of grey-roofed houses and a long winding street and the sound of many bells came over me’. 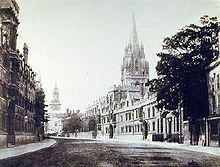 That long street is Oxford’s High Street – or the High, in the old discredited class-argot of the university – winding its way from Magdalen College in the east to Carfax in the west. Nikolaus Pevsner once described it as ‘one of the world’s greatest streets’, and a favourite Oxonian pastime has been to locate the precise spot at which the long gracious curve of the road and its buildings can be seen to best advantage. Thomas Hardy played this little game in June 1923 – his local guide on that occasion being the Queen’s College Fellow in History Godfrey Elton, who notes in his 1938 autobiography Among Others that, after touring Hardy around Queen’s itself, ‘Next day … I was escorting him to look for the exact point from which the curve of the High looks loveliest’; alas, he does not reveal the precise point of vantage they chose on that occasion. So it now in retrospect strikes me as slightly odd that, when working on my book on William Morris in Oxford (2007), I did not seem to come across any references to Morris and his friends indulging in this local practice, either in their undergraduate days – of which there are so many colourful anecdotes - or after. Or did I just somehow carelessly miss them, I wonder?